A game by Matthew Yeager, Ricky Roberson, David Laskey, and Benedict Fritz made for Train Jam 2015. Pump a push-cart in sync with a friend and try to get as far as you can! PumpTrackx is a two player game. One player uses the W (up) and S (down) keys, and the other uses the I (up) and K (down) keys. 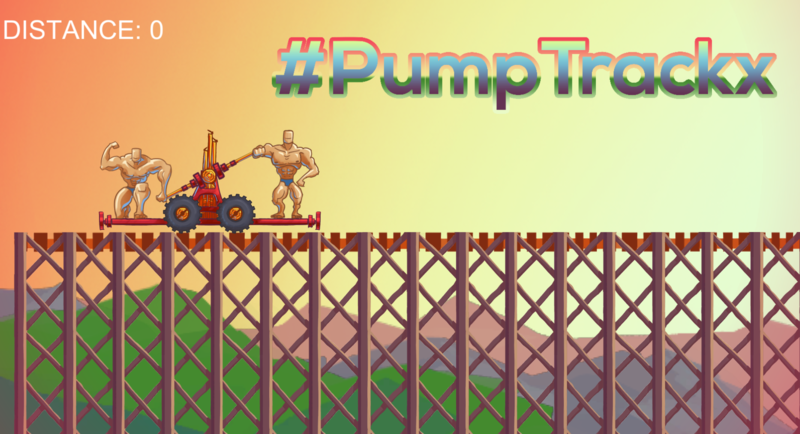 PumpTrackx is about pumping your push cart as far as possible. You move the pushcart by having both players simultaneously push keys in opposite directions to pump their cart. If you are crouched, hit up, and if you're standing, hit down. A recommended technique is to push the keys to the tempo of the music to help timing. Some obstacles require you to jump. Jump over obstacles by having both players hit the their up key simultaneously. The most challenging opponent is the dastardly muscle-tree. To avoid the muscle-tree one must execute the Ground-Pound. This requires the players to jump the cart (both push up simultaneously), and then pushing down at the same time. If the ground pound is executed right before encountering the muscle tree the players can break through the track and land safely on another track beneath the tree.